Panama is a country with amazing history, culture, and traditions and we Panamanians like to celebrate. Thre are many reasons to visit Panama. You have probably already thought of the Panama Canal, which is one of the world’s most famous feats of modern engineering. Maybe you have considered the exotic jungles or the weather, which is warm year round. But there is much more to discover in Panama including our Festivals and Traditions. A list of all calendars and festivals are on this link but below some of our favorites. 1. Panama Jazz Festival – Every January, Panama welcomes summer with the Panama Jazz Festival. The festival attracts international artists, promoting Panama City to the world of jazz. The festival is the most important annual event held by the Danilo Pérez Foundation committed to positively transforming society through music. The week-long event includes free shows, classes, concerts, and educational activities centered around music and culture. In 2017, the four-time Grammy award-winning artist, Esperanza Spalding, headlined the events. 2. Boquete Flowers and Coffee Festival – Boquete blooms every January with the Flower and Coffee Festival. This ten-day festival featuring the popular coffee from Boquete artisans and amazing flowers have been held in Boquete since 1984 with the purpose of promoting agricultural development and tourism. The fair includes folkloric groups from Colombia, Ecuador, and Bolivia and local bands. 3. Festival de la Pollera -During the month of July, the town of Las Tablas in Los Santos province, holds a festival in honor of one of the world’s most beautiful national costumes, the Panamanian Pollera. This festival is held at the Belisario Porras park in downtown Las Tablas. The celebration joins with the festivities for Santa Librada, the patron saint of Las Tablas, whose day is July 19. The most anticipated part of the festival is the National Pollera Contest, in which women from across the country, including the current Carnival Queens, compete for the Margarita Lozano medal. 4. Festival del Congo de Portobello -The most unique and colorful manifestation folklore of the province of Colon. The tradition of the dances and the interpretation of the Afro-American culture are expressed with an impressive visual wealth in the Festival of dances of Devils and Congos of Colon. These dances have great historic value in the Afro-Panamanian culture and the Diablo is said to be a representation of ferociousness of slave masters. For the 14th edition, the Jazz Festival takes place in Panama City, from the 10th to the 14th of January 2017. This celebration is a cultural project where the creativity, exchange, talent and inspiration made of this event a real international reference which welcomes more than 20 thousand people each year. For 2017, the festival is proud to dedicate the event to the famous singer Violeta Green, for its contribution. Thanks to the help of the government, private companies, non-governmental organizations and a large public, the capital of Panama becomes the backdrop of world jazz for 4 days. It is the most important event of the year that the Danilo Pérez Foundation undertakes. So book your tickets online NOW, join this event and enjoy the 25 artists of this festival! Everything began in 1965 when Danilo Pérez Urriola (father) decided to use the music for young people in troubles, in the province of Colón. He wrote a thesis about how the music can help these young to practice their creativity and becoming good citizens. Afterwards, his son, the famous jazz pianist Danilo Pérez Samudio, decided to create some free music classes for young people and, after some studies in the United States, he became a prominent Jazz figure and established the famous music program Jamboree Juventud de Panamá in 1980. After various helps in some Jazz programs and many concerts and master classes in Panama and all over the world, he decided to start the International Jazz Festival in 2003. He also finally founded the Danilo Perez Foundation in 2004, in order to organize educational events and doing of these programs, a sustainable project that can reach all the country. He wants to make of this event, a real international jazz festival of the highest category. The first year, the Festival welcomed over 8 thousand people and more than 200 music students. On the 11th edition, the Festival attracted more than 25 thousand people and over 2 thousand students from all over the world. Since its beginning, they have counted more than 220 000 persons worldwide. The Panama Jazz Festival is made of music lessons during the week from 9am to 4pm, followed by various concerts in different parts of Panama City. The music lessons are made up of instruments, composition, folklore, classical music, improvisation, musical therapy, and many other topics directly linked to music. The professors who teach the lessons are the best students and teachers of the music schools, in partnership with the festival. Furthermore, since the 11th edition, the total amount announced in grants during the Panama Jazz Festival, exceeds 3,5 billions of dollars. Take part of this unique moment that is this Panamanian Festival. Simple amateur or a big fan of Jazz, you will spend such a good time listening the 25 artists, dancing with your friends, meeting people and sharing your passion for music. You won’t be disappointed, that’s for sure! There are many reasons to visit Panama. You have probably already thought of the Panama Canal, which is one of the world’s most famous feats of modern engineering. Maybe you have considered the exotic jungles or the weather, which is warm year round. But there is much more to discover in Panama! Cultural Diversity – The Panamanian cultural diversity consists of indigenous groups who keep their culture alive today to Caribbean and Latin American sub-cultures with influences of the Spanish conquistadores and also the pirates. Today, the country’s population is made up of Chinese, Jewish and Arab neighbors living in harmony with people and backpackers from around the world. Making Panama a truly and colorful melting pot. Wildlife – There are an incredible number of animals living in Panama. Roughly 230 types of mammals and more than 1000 bird species. This does not include the numerous reptiles, amphibians and insect species! You can spot amazing wildlife at just 45 minutes from the City limits. Butterflies as large as your hand freely fly through neighboring rainforests. There are sloths, Howler monkeys, toucans, agotis, coatimundis and other animals that make their home within the city limits of Panama City. Just imagine what you may encounter in the countryside… tiny brightly colored frogs, ocelots, anteaters and more. Different Places to Be – It is quite well known that Panama has superb rainforests. Jungle excursions are a definite option here. For a slight change of scenery, we recommend visiting the cloud forest in the highlands, where lush mossy trees are covered by the fog and where wild orchids flourish. But this not only what the country has to offer. There are mountains, where world-famous coffee is grown such as the Geisha; mangrove swamps and even a desert in Sarigua, Azuero. And we have coasts on both sides of the country, 2,500 kilometers of it to be precise. Numerous beaches and islands in the Caribbean Sea and off the Pacific Coast are waiting to be explored. Crystal clear waters meet white sandy beaches with the occasional coconut tree, Panama is the place to be! Coral reefs? Panama has those too. And it’s all within easy reach. All it takes is few hours’ drive or a short flight to arrive to a unique picturesque destination! There is even a national park inside the city limits of Panama City! Things to Do – There are many things to do in Panama. Adventure? There is river rafting, rock climbing, snorkeling and wilderness expeditions in the jungles of Darien, just to name a few. Also there is great kayaking as well, mountain biking, horseback riding and many other outdoor sports. There are many great surfing and diving spots that can be found in both oceans and the wonderful beaches on both coastlines. And for those who have had enough activity, there are so many hidden island retreats and luxurious spa options. Panama’s rich culture offers arts, cultural celebrations, great food and drink and local fiestas. Panama City – Panama City deserves a visit. The Biodiversity Museum by Frank Gehry, little art galleries and amazing restaurants are waiting to be discover by you. Every weekend brings a new event, festival, concert or an exhibition. The beautiful colonial old quarters (UESCO World Heritage Site) known as Casco Antiguo, is always worth a visit. The combination of the old and new Panama City offers traditional crafts and modern art; old buildings set against the backdrop of the modern skyline and the accessible National Parks. And don’t miss the Jazz Festival in January! Music unites all Panamanians as an integral part of our culture of happiness. Our country is a bridge where our local Indigenous groups along with Spaniards, French, Afro-descendants, Zonians among others play an import role in building our cultural identity. Panama has its own distinct sounds and the musical influence of our local indigenous population can still be felt today throughout the country. La Saloma (local campesino yodeling), Mejorana (a five-stringeg guitar), tambores (wooden drums) and accordion are popular in the traditional folk music and are getting more popular amongst the new generation of local musicians that want go back to the roots by mixing folk and traditional with modern sounds. Panama also boasts a vibrant history of calypso and mento music sung by nationally well-known musicians such as Lord Panama, Delicious, Two-Gun Smokey, Lady Trixie, Lord Kitty, and Lord Cobra. Also Reggaeton is well known in Panama with the famous artists: Nando Boom, Kafu Banton and El General. Festivals such as the Annual Jazz Festival, Macro Fest and others are inspirations for local talents to create new and innovative music by mixing the sounds of Panama. Come and discover the amazing sounds of Panama that reflect the country’s unique diversity. Sandra and Samy Sandoval and Ulpiano Vergara for típico interiorano (Local typical music). A generation of Panamanian rockers are: Los Rabanes, Señor Loop, Carlos Mendez, Los Miserables and Llevarte a Marte among others. And the most international Panamanian musicians: Ruben Blades a salsa solo musician and Danilo Perez a pianist and jazz star. The beautiful Chiriqui Highlands have long been one of Panama’s most favorite vacation and retirement spots, and the jewel of Chiriqui province is beautiful Boquete. Located at an elevation of 3000ft it is also the home of some of the best coffees in the world. The cool, crisp mountain air, delicious fresh mountain water, an abundant nature with lots of flowers, flamboyantly flowering trees and hundreds of species of birds plus the closeness to two oceans have attracted visitors from all over the world.The natural beauty of Boquete is the perfect setting to stimulate the creative talents and artistic abilities of those who live here as well as those who come for a visit. So it is no surprise that this small town hosts a lively art and music scene which culminates in the annual Boquete Jazz & Blues Festival. 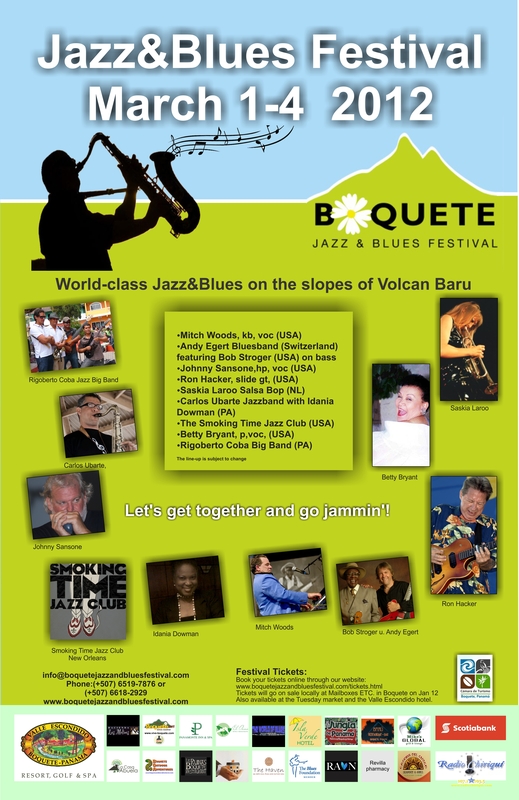 Right from the start in 2007 the Boquete Jazz & Blues Festival has been the biggest music event in the province of Chiriqui. The 2012 edition will also be the first ever festival in Panama to showcase first-class international Blues acts in addition to notable Panamanian and Latin American artists featuring Jazz and Latin American music styles.